Polman Stadion is the home ground of regular Eredivisie staple, Heracles Almelo. Built in 1999 with a capacity of small 8,500 and a made from artificial turf, the club have announced plans to relocate to a new 15,000 capacity stadium, although there’s no confirmation when this will happen. 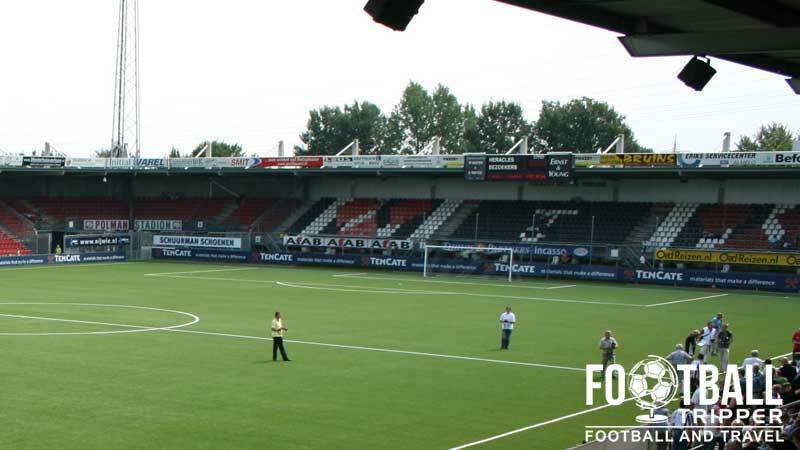 Polman Stadion first opened on the 10th September 1999 in time for the upcoming season with the inaugural match held against FC Zwolle in the Eredivise. Constructed at a time when Netherlands were set to co-host Euro 2000 with Belgium, the 90s represented a period of growth for football in Holland as numerous clubs began to construct new stadiums. Heracles Almelo’s previous stadium, Bornsestraat, dated back to the early 20th century with the club using the ancient facilities for a period of 90 years between 1909 until 1999 when they moved to the brand new Polman Stadion. The new stadium was initially constructed with a smaller 6,900 capacity but early demand for season tickets led to the club expanding the stadium to the current 8,500 capacity in 2005. 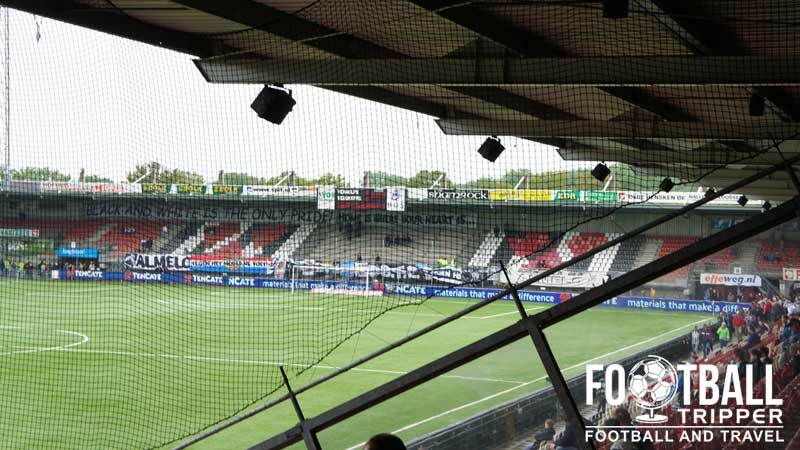 Currently the club are assessing the feasibility of expanding the ground to anywhere between 10,000 – 13,500 with Almelo city council earmarking over €8.2 million in funds to assist Heracles in its project. The club formalised arrangements on the 13th January 2014 with the club announcing the objective of expanding the current ground in time for the 2015/2016 season. Renovation is currently taking place and will see the addition of a second tier of seating. Polman is comprised of four stands: North, East, South and West. Click the thumbnails above to enlarge an image of each stand – warning they are out of date and don’t take into account the new second tier! Away fans are housed within the south-east corner of the stadium within sections GG, GH in the upper tier and G in the lower section. Until the renovated stadium opens and we know the exact opening times of the club shop you might want to purchase your official merchandise from the online store. Two helpful members of staff inside the Heracles Almelo Fanshop. 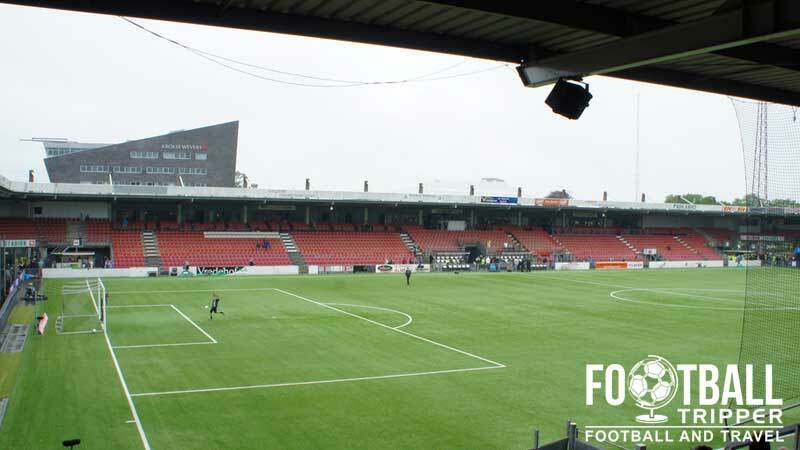 We’ll update this section as soon as we know whether or not stadium tours will be available of the new facilities at Polman Stadion. 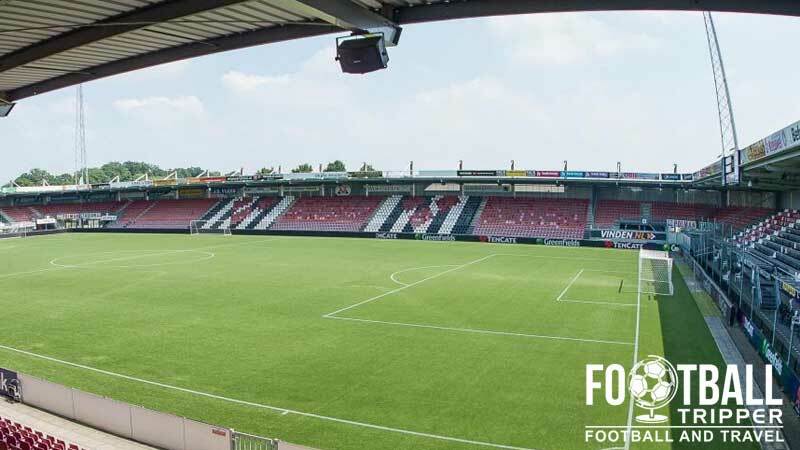 Tickets to see Heracles in action at the new Polman Stadion can either be purchased online or in person from the ticket office in the days leading up to the match. If any tickets remain on the day of the match they will be available to buy from the FanServiceShop. 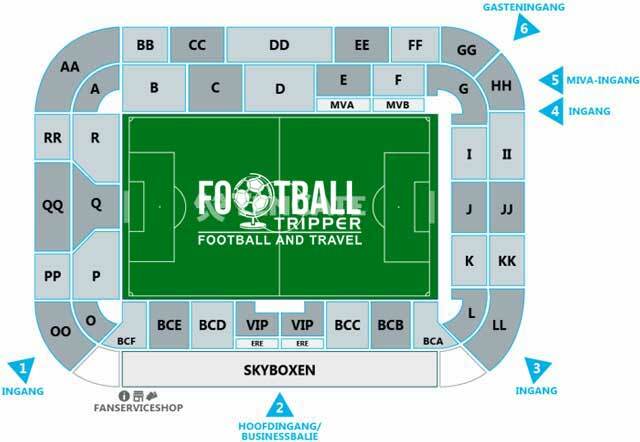 Please note that there is a surcharge of 5.00 for the the highest profile matches against the four largest teams in the country: Ajax, Feyenoord, PSV and FC Twente. Polman Stadion is located 2.3 km south of Almelo railway station within the Ossenkoppelerhoek district. From the approximate city centre the average Football Tripper should be able to walk to the ground in just under 30 minutes. A majestic view of Polman Stadium. There is a medium size car park to the left of the stadium however the matchday parking arrangements mean it is usually reserved for those with pre-bought parking permits only. Almelo railway station has is well connected to the rest of the Netherlands with numerous Intercity and Sprinter train services to major cities such as Utrecht and Den Haag. South-west of the stadium just past the Stadionlaan and De Tortel interchange there is a bus stop known as “Almelo, Stadion”. This appears to be served by bus numbers 21 and 22. The closest airport to the city of Almelo is technically Münster Osnabrück 101 km away in Germany, however the one in Groningen is only 7 km further away. Amsterdam-Schiphol, the largest international airport in Netherlands is 159 km away and is connected to Almelo by a direct train service. As there are no hotels within the immediate vicinity of Polman Stadion you’re looking at a 25 minute walk back towards the centre of town. Here you will find limited accommodation options with the Theaterhotel, Huis Van Bewaring and Preston Palace being the three most suitable options.